By emphasizing social interaction in campus design, colleges and universities can enrich the campus experience, boost enrollment and offer cost effective benefits not available through online learning. 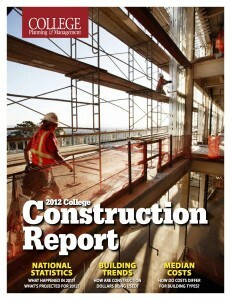 Building Design + Construction observes the following trends in college construction. Large multi-use, university center facilities that may include areas for dining, lounging, recreation, retail, exercise, studying and social interaction. Bringing dining areas out of the basement, and adding variety to food options. Emphasizing health and wellness, including healthy dining options, fitness and recreational activities. Adding lounging areas and study areas with whiteboards, projectors and presentation tools to dormitories. Sustainable design and construction integrated in ways that are visible to students. U.S. school districts spent $12.2 billion in 2011 on PK-12 school construction, and Americas colleges and universities spent another $11 billion in 2011 on new buildings, additions and campus retrofits. These levels of school construction spending are expected to remain about the same in 2013. While significant, school construction spending is down about a third from record high spending in 2008 and 2009. Why? Reduced State Revenues School construction funding is increasingly a local responsibility as states cut support. Local spending initiatives require approval of bonds and/or property tax increases.